Before I moved from the big city to the Southland, I didn't know too much about smoked food. 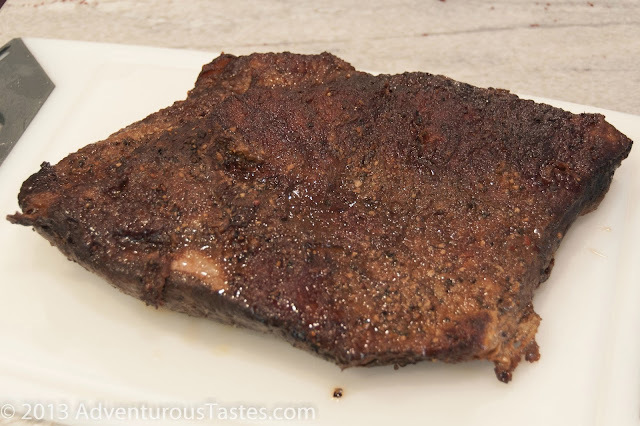 I'd heard of it, of course, and I even remember adding some hickory chips to the BBQ - er, as I've been corrected numerous times in the South - the grill - for a little bit of smoky flavor. Still, I had no idea until I moved to the ATL that there are legions of dedicated smokers out there. When a friend recently got a traditional smoker, I got a glimpse into why smoking meats requires dedication. It takes hours, and not just hours of waiting but hours of tending the fire, monitoring the temperature and monitoring the meat itself. The results were delicious, but it was a ton of work. Fortunately there's an easier way, as I learned when the good folks at Masterbuilt asked us to give one of their electric smokers a try. When the ginormous box arrived at our door, I felt like it was Christmas morning. After about 15 minutes of unpacking and attaching the wheels and a few other accessories, I was good to go. About the size of a dorm fridge, the Masterbuilt Electric Smokehouse is light enough rolling it onto our back deck was no problem. The smoker is a pretty cool piece of equipment. On top of the sleek stainless steel unit is a panel of electronic controls, plus and there's also an RF (radio) remote control that lets you monitor things from afar. Inside the cabinet are four metal racks, a stainless steel dish for water, a light, and a cooking probe that gives you the internal temperature of whatever you're smoking. 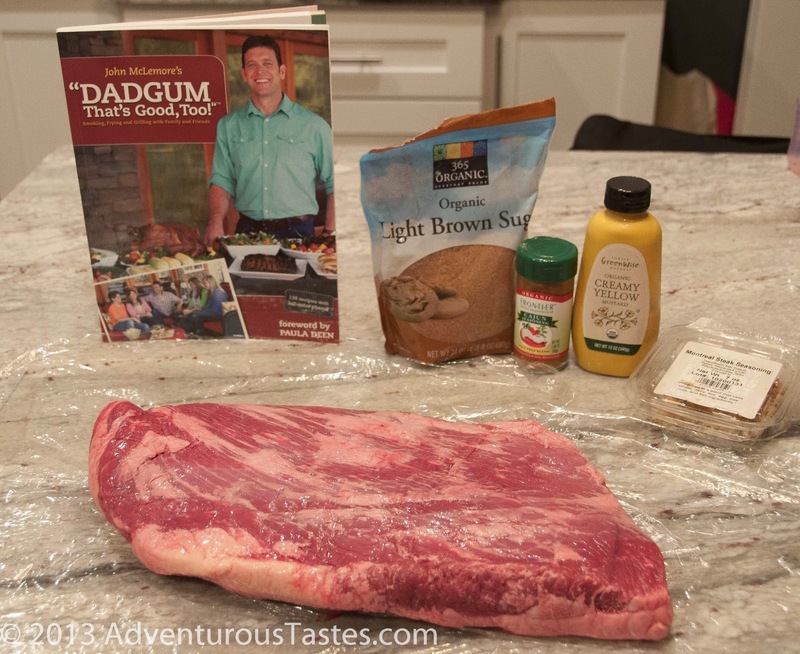 Along with the smoker, we got two great cookbooks by John McLemore, "Dadgum That's Good!" and "Dadgum That's Good, Too!" McLemore is not only an expert smoker, he's the CEO of Masterbuilt, which was founded by his dad in Columbus, Georgia. Both books are full of straightforward recipes for smoking, frying, and grilling, as well as huge color pictures and some nice stories about John's family and friends. After a trip to the store for a bag of hickory chips, the first step was to season the smoker by running it for a few hours empty except for the chips. With that out of the way, I was ready for my first run with a six pound beef brisket from Costco. Everything needed for a great brisket, minus the smoker. 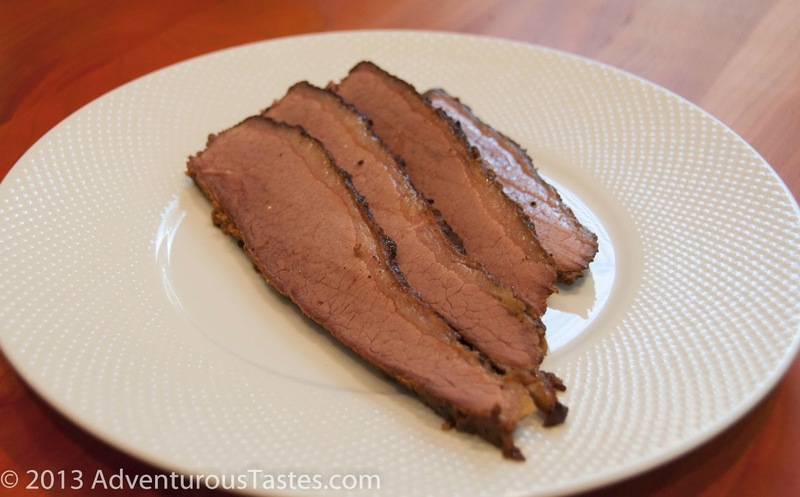 There were a few brisket recipes to choose from between the two books, and while they all looked great I ultimately chose the simplest one, "Keith's Beef Brisket" from the second "Dadgum" book. With only five ingredients, it was my kind of recipe. 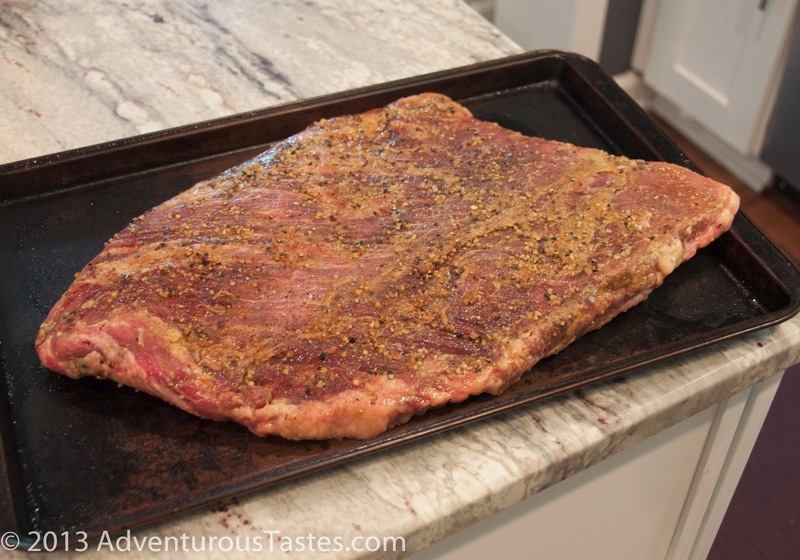 The night before, I spread out several sheets of plastic wrap and laid the brisket on top. I trimmed some of the thickest fat deposits down so that the fat was about 1/4" thick. Next, I rubbed a generous amount of yellow mustard all over the brisket and followed that up with Montreal Steak and Cajun seasoning. Finally, I put a layer of brown sugar on the brisket. I wrapped it tightly with the plastic wrap, stuck it on a rimmed baking sheet (this is important as some liquid will leak out of it while it sits), and put it in the fridge overnight. The next morning I took it out of the fridge a little over an hour before I wanted to put it into the smoker. Outside on the deck, I got the smoker fired up to 225F. The recipe called for 250F, but I was not in a hurry and decided to turn a down a notch, having seen 225F for most other smoked brisket recipes I'd looked at. Brisket in the smoker, fat side up. Protip: don't stand there with the door open for five minutes taking pictures! With the smoker heated, I put the brisket in fat side up. This ensures that the fat bastes the meat as it melts and runs off. 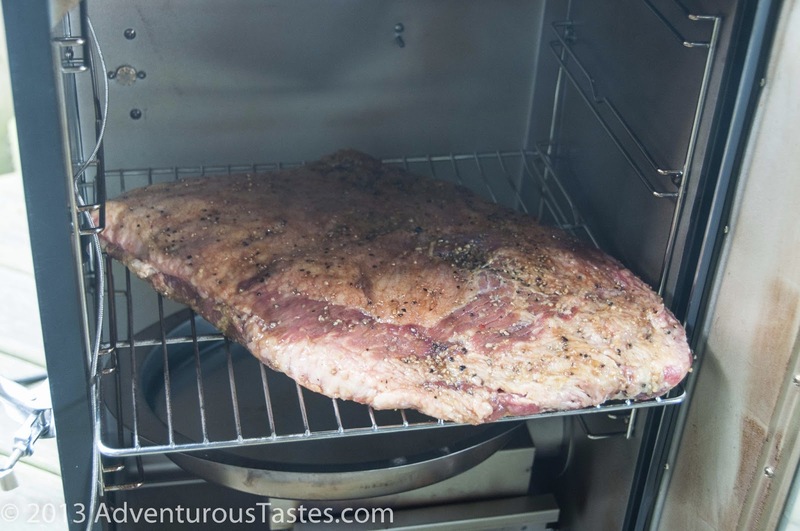 I added some water in the steel dish below the brisket to help keep the brisket moist, stuck the temperature probe into the deepest part of the brisket, and closed the door. Before heading inside, I added a cup of hickory woodchips to the chip tray via a hopper that inserts in the side of the smoker. With this smoker there's no need to worry about soaking the chips before adding them, which is convenient. I monitored the meat's internal temperature with the remote control unit that comes with the smoker. After roughly 2-1/2 hours the temperature hit 155F and it was time to wrap the brisket in foil. Using these fantastic insulated food gloves, I was easily able to remove the brisket, wrap it up and put it back into the smoker. The goal was to get the internal temperature up to 185F, which came about 1-1/2 hour after I'd wrapped the brisket in foil. Once I removed the brisket, I kept it wrapped and let it rest for 30 minutes. I then sliced it, cutting across the grain of the meat. Served with some BBQ sauce, it was as good a brisket as I've had! And incredibly easy, too. Of course, you can smoke more than meat. John's cookbooks contain recipes for all kind of smoked vegetables, mac & cheese, casseroles, you name it. It's a far more versatile mode of cooking than I ever would have imagined. I'll keep you posted on my smoking adventures as they come. 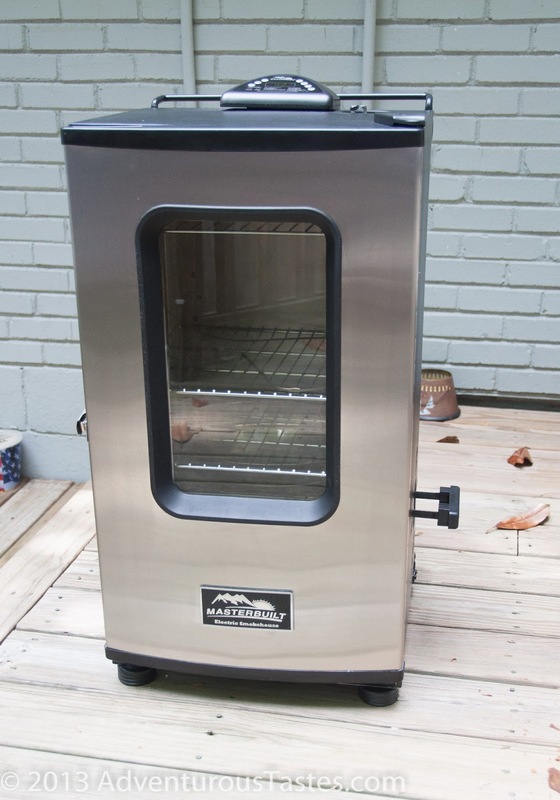 In the mean time, I'll put in one last plug for this smoker: it'd make a heck of a lot better Father's Day gift than a shirt and tie! The cookbooks: Dadgum That's Good! and Dadgum That's Good, Too! 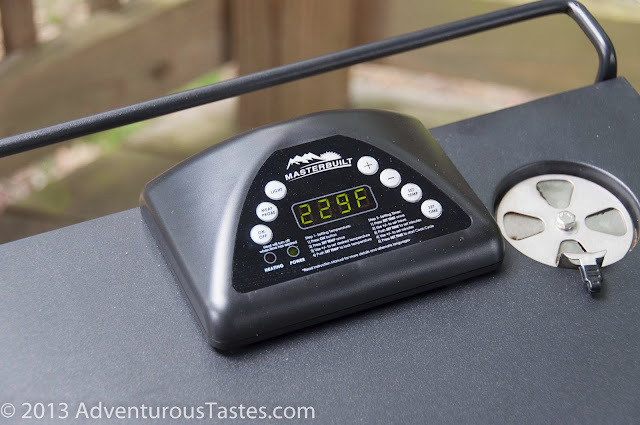 * As I mentioned, Masterbuilt generously provided the smoker and cookbooks for my review. As always, I did my best to provide an unbiased opinion.